Our Aeron Bar (at the opposite end of the building from the guest rooms!) 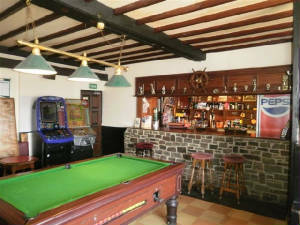 offers a pool table, dart board, TV and Juke Box. A selection of board games and puzzles is kept behind the bar to occupy the children. There is a small library of books and another TV in the Buffer Stop. There is a vast stock of leaflets on local attractions to help you plan your next trip out.